Pro Se Productions, in conjunction with Altus Press, started the PULP OBSCURA imprint, to bring obscure, often forgotten Pulp heroes to life again in new stories. Now, Pro Se proudly announces that one of the first characters featured in the line is back for his second volume of adventures. Jeff Shannon, top notch U.S. spy, fights again in THE NEW ADVENTURES OF THE EAGLE VOLUME TWO! The Nation's Ace Troubleshooter, the Country's Amazing Master Spy returns in all new tales in THE NEW ADVENTURES OF THE EAGLE VOLUME TWO! Jeff Shannon is The Eagle- America's Ultimate Secret Agent! The Eagle's Mission: To Wage a One Man War Against America's Enemies and those Who Threaten Liberty Across The Globe! One of Pulp’s forgotten heroes takes on evil and injustice head on! Pro Se Productions in Conjunction with Altus Press Presents a New Volume in its PULP OBSCURA line! Authors Teel James Glenn and James Hopwood return to the 1950s, taking Shannon to new heights of intrigue, espionage, and danger! Fight alongside Jeff Shannon as He keeps America safe from evils, at home and abroad in THE NEW ADVENTURES OF THE EAGLE! From Pulp Obscura and Pro Se Productions. 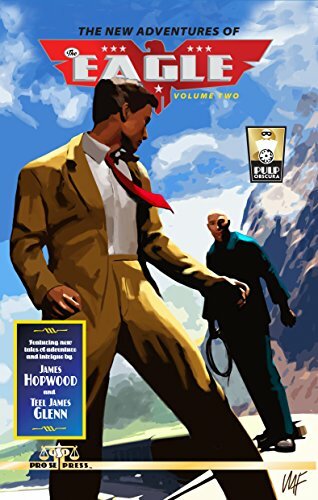 Featuring an exciting cover by Mike Fyles and print formatting and book design by Sean Ali, THE NEW ADVENTURES OF THE EAGLE VOLUME TWO is available now at Amazon at https://www.amazon.com/New-Adventures-Eagle-Two/dp/153474522X/ref=sr_1_1?ie=UTF8&qid=1467061216&sr=8-1&keywords=the+new+adventures+of+the+eagle and Pro Se’s own store at www.prose-press.com for 10.00. The second volume of Jeff Shannon’s new adventures is also available as an Ebook, designed and formatted by Antonino Lo Iacono and available for only $2.99 for the Kindle at https://www.amazon.com/New-Adventures-Eagle-Two-ebook/dp/B01HJ2IIUA/ref=tmm_kin_swatch_0?_encoding=UTF8&qid=1467061216&sr=8-1#nav-subnavand for most digital formats via Smashwords at https://www.smashwords.com/books/view/645767.